As Greg Chappell puts it, it was far better to have him on your side than have the prospect of him whistling the cherry around your ears as an opponent. 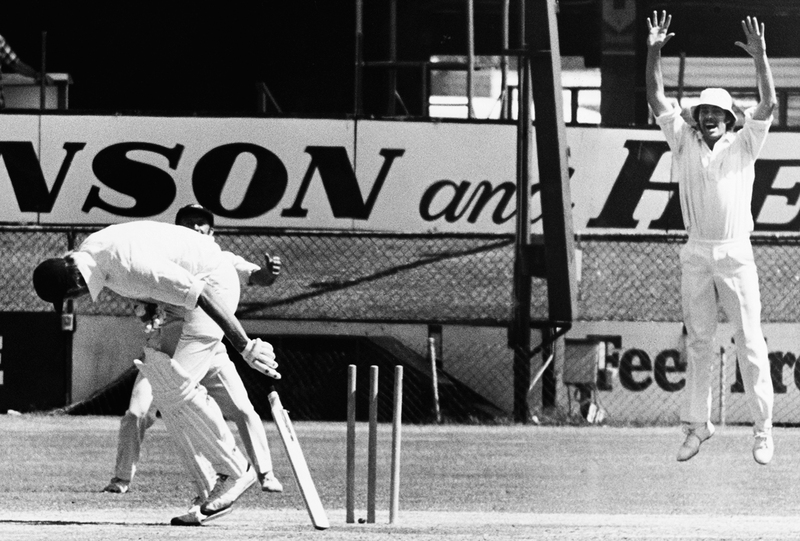 And in 1973-74, as captain of Queensland, Chappell found Thomson a prime target for recruitment. Greg Chappell: My first memory of facing Thommo was at the Sydney Cricket Ground, playing for Queensland in the last game in 1973-74. We were leading the Sheffield Shield table going into that game and first-innings points would have got us the Shield for the first time. New South Wales had not picked Thommo at all during the season, but did choose him for this game. Before going to the ground for the first day's play I read an article in the paper where he said this was going to be his last game for the state. I won the toss and elected to bat first, only to be confronted by this whirlwind from the Randwick end, steaming in up the hill and bowling quicker than anyone I'd ever seen. Probably as inaccurately as anyone I'd ever seen, but he frightened the bejayzus out of everyone. He finished with seven wickets and just blew us away. My attention had been captured and I couldn't wait to get down to the New South Wales dressing room after play that day… where I knocked people out of the way to find this Thommo bloke. The Queensland hierarchy went to work and during the winter months Thomson packed up and moved north to continue his career. Meantime, Greg's brother Ian was forming his own opinion. Ian Chappell: I first came up against Thommo in a Sheffield Shield game in Adelaide. I missed him the first innings, but in the second, one of our openers was injured so I went out to open the batting with Ashley Woodcock. I got down the other end not long after that and then he did drop one short. Well, I got about halfway through the hook shot and, whack, it hit me on the gloves. Of course, it wasn't the leg-cutter - it was the proper short one. It was a good height for playing the pull shot, but, crikey, it wasn't the right length. I thought I might have to reassess the situation a little bit. In fact he was the only bowler that I ever considered was unhookable. The one from Thommo that you thought was short enough to hook you couldn't reach. It'd go sailing over your head - the wicketkeeper's, too. But the one that was at the right height to hook simply wasn't short enough. One WA and Australia batsman remembers the harrowing experience of facing Thommo for the first time. 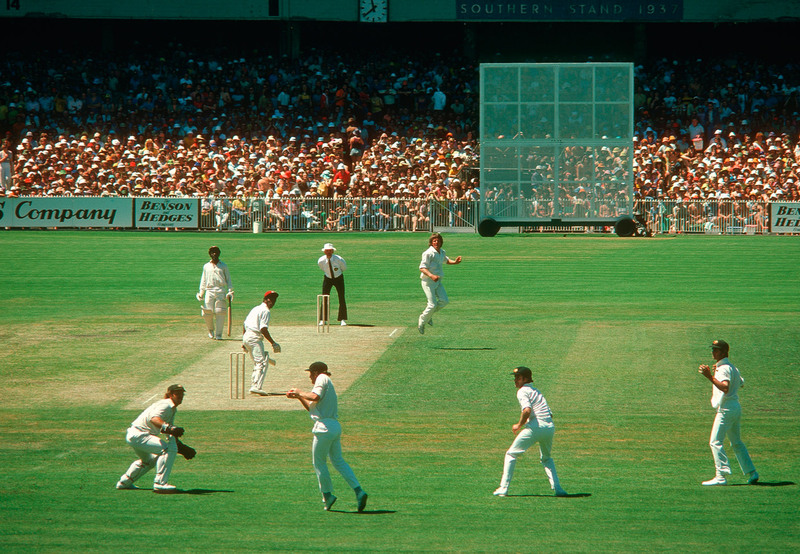 It was a Sheffield Shield game in Brisbane in late 1974, just before the first Ashes Test at that ground. There we were, a week later in Brisbane, making our own judgement. WA batted first and as we watched Thommo our eyes were just about popping out of our heads. I went in at No. 4 and was at the non-striker's end, with John Inverarity waiting for Thommo. Usually you can hear the bowler running in, but with Thommo you couldn't because he ran in on his toes. Well, I saw Inver start to move - just as the ball hit the wicketkeeper's gloves - above his head. Next thing I'm on strike at the beginning of a Thommo over - he bowls two no-balls and it turns out to be a 10-ball over, which is one thing you definitely don't want when you're facing him. One ball was a yorker, which flew off the inside edge of my bat and went for four before fine leg had even moved. With one ball remaining I'm thinking, 'If it's anywhere outside the stumps I'm going to let it go.' Well, it came down outside off stump, I thrust my front leg forward, it hit me on the thigh pad - and went through to hit the stumps. Greg Chappell: He was so quick - and so frightening - that blokes just didn't want to bat against him. There were guys literally running away. And there were guys who were normally pretty composed and solid cricketers but who were totally discombobulated when Thommo ran up and stuck the thing behind his back and let it fly. The thing was, Thommo wasn't the best trainer in the world. His idea of a fitness program was a bit of pig shooting, a bit of fishing. Running around the oval wasn't one of his high priorities. But he was happy to bowl all day. The nets at the Gabba were so poor that he didn't bowl a single ball there in the pre-season, his only work off the long run being a few disinterested overs in club cricket. In a trial game before his first Sheffield Shield outing he was so all over the place that Jeff Langley, who had come up from South Australia to play, was hit twice by Thommo deliveries while crouching at bat-pad. One on the leg and one on the backside. What I found with Thommo was that his first spell of the season was generally pretty ordinary. Always frighteningly quick, but leaving a little bit to be desired, direction-wise. If I made him bowl five or six in his first spell, then his second spell would be much better and by his third spell he was fine. However, there was one time when he got to his third spell - it was with the second new ball - and he was all over the place, hardly landing the ball on the rolled-out part. We badly needed a wicket at this stage, so I ran up and asked him what was going wrong. 'Oh,' he said, 'I just can't control the swing'. I was just taking off to return to the slips, confident that at least there'd be some improvement in direction, when he called me back. Another time, again the first game of a season, he was having trouble with no-balls and was all over the place. Again, I ran up from the slips and asked him what was going on. 'Well, try fourteen and see how you go.' Sure enough it was fourteen. Here's an example of just how quick Thommo could be. We were playing against Victoria in the poor light of a late afternoon and Mick Taylor, a handy little bat, was out there facing him. The first ball hit Mick's bat when it was still on the backswing. It gave him a helluva shock. After that he was too scared to take the bat back … and finished up with a forward lift. 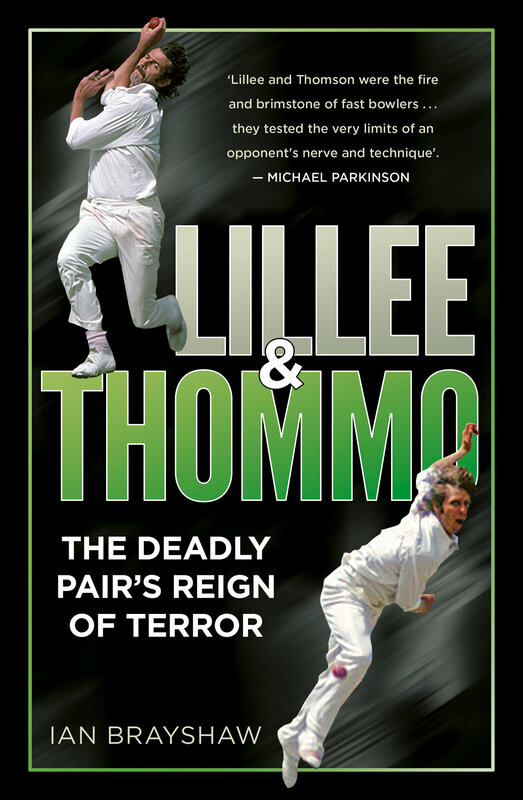 Dennis Lillee: Thommo and I hardly knew each other before Brisbane, but we got on straightaway once we were in the same team. He was a man to put the fear of God into batsmen in any era, through pure and simple pace. It was nothing to do with guile or where the ball was going. For outright natural ability, and a bloke who didn't seem to train a lot, lived life to the full and played cricket for fun, he was amazing. He was a wonderful natural athlete, a terrifying prospect for any batsman. Off that jaunting bit of a run-up he wound up so much pace. Because he was so quick he could afford to pitch a bit fuller, but still the ball would rear up. He has always been a man of few words, almost an introvert. We often roomed together, yet we'd never talk about cricket. I used to think about these things a lot, but with Thommo it was all gut instinct. An uncomplicated guy, but, having said that, streetwise and smart. And he could turn his hand to most sports. 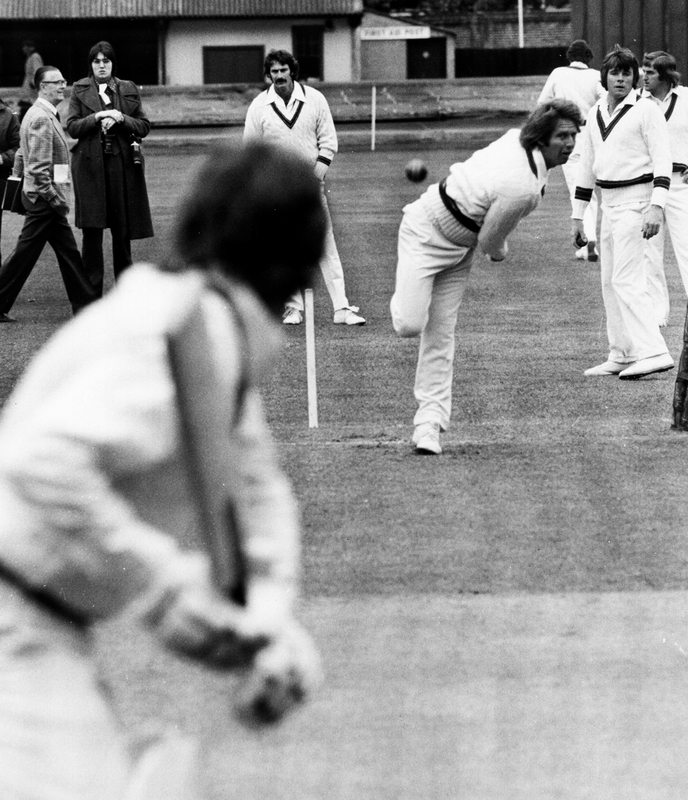 Rod Marsh: There were times when I thought, 'It's impossible for anyone to bowl faster.' Some say he was faster than the 160 kilometres an hour that he was measured at. I don't know, but what I do know is that he was faster than anyone I ever kept to. Add to that the fact that he was able to make the ball climb from a length better than anyone I ever saw. That's what the West Indies found in 1975-6 - that a length ball could pass by their chins. That's frightening. From my point of view the worst thing about that particular series is, if you have a look at the byes: astronomical! They were going past the batsman's chin, so not a wide, then one bounce into the sightscreen. There was no hope of the keeper reaching a heap of them. Viv Richards: When he found that length - basically just short of a good length - he was as good as it gets. The amount of wickets he took with balls lifting sharply off a good length was amazing. For that special delivery, no one could match Jeff Thomson for raw, lethal pace. He was very special, you know.